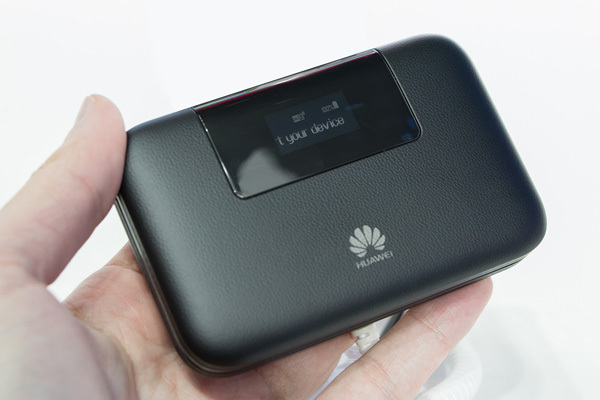 Huawei has unveiled a new mobile LTE hotspot E5770 with integrated RJ45 LAN interface at MWC in Barcelona. The E5770 LTE router also has a very powerful battery (5,200 mAh), achieving an operating time of up to 20 hours. The Internet could be connected via the LTE cellular modem or via LAN interface. The Huawei E5770 is the first mobile wireless router from Huawei, which is combined LTE Category 4 with a RJ45 LAN interface and a powerful battery. As we know before, the fastest 3G mobile Wi-Fi hotspot was Huawei E5730, which also has an Ethernet port, but unfortunately it did not support LTE, and a maximum of 42.2 Mbit/s could be achieved on UMTS network. Huawei E5770 provide better solution with higher speed for LTE network. The Huawei E5770 comes with a black, leather-like plastic surface and has a small 0.96 inch OLED display on the front that displays the information such as the network operator name and the used data volume. Under a cover on the side, you will find the RJ45 LAN port and the microUSB port for charging the battery. 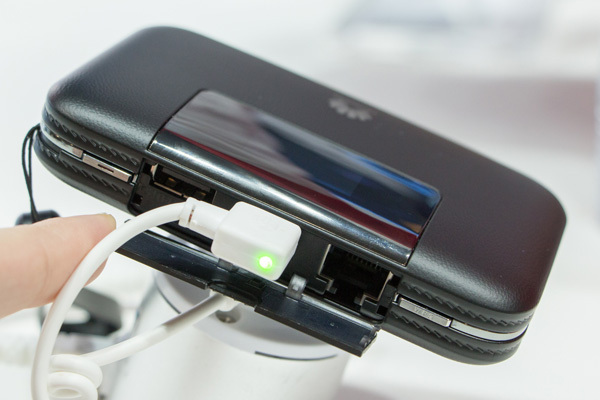 In addition, a USB with output of 5V/2A is available, so you can use the Huawei E5770 also for charging other devices such as smartphones (“Power Bank” function). Based on the LTE Modem in Huawei E5770, it can reach speeds of up to 150 Mbit/s for the downlink and 50 Mbit/s for the uplink in the LTE network. In the UMTS network, possible speed could reach up to 42.2 Mbit/s in the downlink on DC-HSPA+. Which frequency bands are supported, Huawei didn’t indicate at MWC in Barcelona. However, it is assumed that there will be several variants for different markets like other Huawei models such as E5786. However, it’s a pity that Huawei E5770 wireless module only works in the 2.4 GHz band, the 5 GHz band is not available in this device. Up to 10 users can be connected simultaneously with the Huawei E5770, an eleventh device can connect to the internet via the USB interface. Huawei E5770 is a perfect pocket router for travel. It provides a wonderful solution for business journey. When user need internet at hotel or outdoor, Huawei E5770 would be a good partner. We believe Huawei E5770 will be available soon.